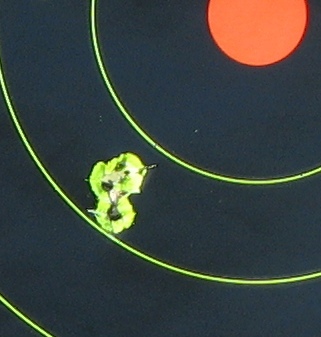 In 2006, I tested my first Accu-Trigger Rimfire, the Savage Mark II BV. It was quite an achievement, in my view, finally addressing the bane of the rimfire: the lousy factory trigger. Coming with a .40 inch 100 yard test target from Savage, that rifle was (and is) the most accurate rimfire I've ever tested. It threw shots into a nickel-sized hole at forty yards with most everything we fed it and in a later range session shot repetitive sub-quarter inch groups. 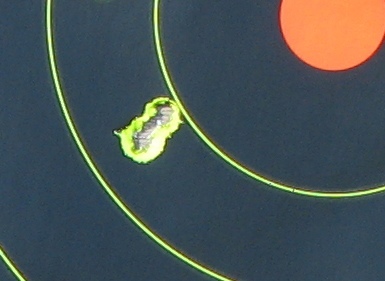 This was with Lapua 36 grain HP ammunition at a laser-verified 102 yards. Have you ever seen Ron Coburn, Brian Herrick, Joe DeGrande and Superman all in the same room at the same time? I sure haven't, leaving open the suspicion that the big S didn't stand for Superman, but just might have been Savage instead. I did carefully go through the box, just to make sure a cape wasn't included with the rifle. I didn't find one, but I think I'd better look again as my eyes aren't getting any younger. The previously tested Mark II BV has a twenty-one inch blued heavy barrel, 1:16 rate of twist, and an overall length of 39.75 inches. This Mark II BSEV has a similar barreled action, only in stainless steel with spiral fluting. Overall length is just slightly longer, at 40.0 inches. This rifle, as I understand it, was originally released in .17 HMR and is now offered in .22 WinMag and this configuration, .22 Long Rifle as well. This type of stock has been referred to as the Barracuda Thumbhole or just as a skeletonized laminate. Boyd's calls it the SS Evolution Royal Jacaranda, billed as the world's first ambidextrous thumbhole. It does have a slight palm swell on both sides, feels great in the hands, so it seems like the palm swell is the ambidextrous part. This latest Mark II has the newer Savage E-Receiver. It seems the folks at Savage are always thinking. The E-Receiver is now being used across the Savage rimfire bolt action line, for .22 LR, .22 WinMag, and .17 HMR. It seems to me that the impetus for this is primarily in the interest of standardization, though there have undoubtedly been a few design tweaks along the way as well. It is mentioned here for those that like to tinker, experiment and swap. With a longer bolt and different hardware in many cases, older style stocks are not completely interchangeable with the current E-Receiver production. The Savage Mark II BSEV is stunningly, if not shockingly, accurate for an out-of-the box rimfire. Whether the Lapua or the American Eagle rounds, it made little difference. 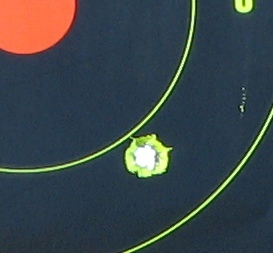 The first shot at 40 yards made a hole, the second shot made a bit bigger hole, and so it went. Whether three shots, five shots, or ten shots you can cover the groups with a dime. Quarter inch C-T-C groups were common. I did compare this new BSEV model to my older Mark II BV, in a casual sense. The new Savage action has a larger ejection port, is a bit smoother, and has less play which likely can be attributed to the longer bolt. I'm inclined to call the E-Receiver both a refinement and an improvement, though I'm ignorant as to the specific changes employed. My impression is that ejection is a bit crisper and stronger than the older MkII BV as well. The Savage Mark II BSEV is a terrific rimfire. With groups like this, under less than ideal conditions and with less than match-grade ammo, perhaps there is a fellow somewhere in the Savage organization that goes by the name of Clark Kent and is allergic to kryptonite? Yes, this particular model is more Buck Rogers than Roy Rogers, but regardless of what model of Savage rimfire suits your personal tastes, if it is a heavy barrel Accu-Trigger with a rigid, laminated stock I'd expect the same level of accuracy. It is a level of accuracy I find astonishingly good, there is no other way to describe it. Savage Arms currently offers some amazingly good production rimfires and the Mark II BSEV exhibits this superbly well. This Savage essentially shoots to the limit of the ammunition you feed it, which is as good as rimfires can get. As to "who wants one," I really can't think of anyone who wouldn't. It was Col. Townsend Whelen who wrote that, "Only accurate rifles are interesting." If you subscribe to that, you'll find that Savage Arms makes the most interesting rifles out there.